Tilda Swinton reads Rumi’s poem “Like This” translated by Coleman Barks. Jalāl ad-Dīn Muhammad Rūmī, also known as Jalāl ad-Dīn Muhammad Balkhī, and more popularly as Rūmī (1207 – 1273), was a 13th-century Persian poet, jurist, Islamic scholar, theologian, and Sufi mystic. Rumi’s influence transcends national borders and ethnic divisions: Iranians, Tajiks, Turks, Greeks, Pashtuns, other Central Asian Muslims, and the Muslims of South Asia have greatly appreciated his spiritual legacy for the past seven centuries. His poems have been widely translated into many languages. 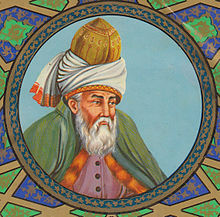 In America, various translators and publishers of Rumi’s poems have described him as the “most popular poet” and the “best selling poet” in the United States. The general theme of Rumi’s thought, like that of other mystic and Sufi poets of Persian literature, is essentially that of the concept of tawhid — union with his beloved from whom he has been separated — and his longing and desire to be re-united. This entry was posted on July 26, 2015 by Vox Populi in Art and Cinema, Opinion Leaders, Poetry and tagged Like This by Rumi, Opinion Leaders, Poetry, Rumi, Tilda Swinton, Video.